The practice of corporate investing, an industry that now seems to drive the American economy, created an ancillary industry which itself directs investment outcomes. Business media, made up of both print and electronic outlets, is widely influential in creating or maintaining corporate success. Among the most important staff members in any national or international corporation are in the public relations department, which dances with the business media to create or direct an influential message. How influential is the business media in the decision-making processes of investors? 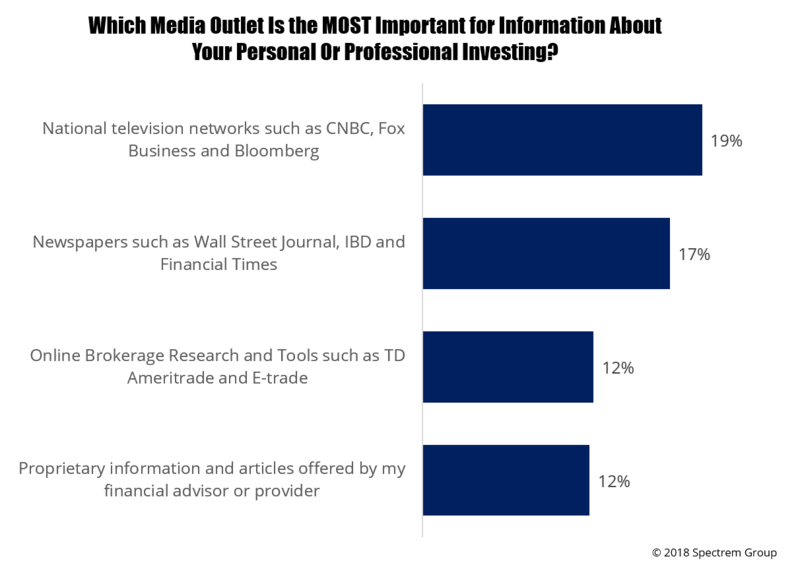 And which media are the most influential among affluent investors? Spectrem’s new study, Portfolio Decision Making, asks investors with a net worth between $100,000 and $25 million to describe their media appetite, and which offering they find the most appealing. Given a lengthy list of choices, ranging from national television networks to podcasts, investors were most likely (36 percent) to consider national networks like CNBC, Fox Business and Bloomberg as outlets which provide important information for personal and professional investing. Slightly less influential is newspapers like the Wall Street Journal, Investor’s Business Daily and Financial Times. Although those newspapers do have online editions, they do require a paid subscription, so either investors are paying to read the articles online or they are getting those newspapers home delivered, which is a positive sign that the newspaper industry is not yet dead. Almost one-quarter of affluent investors get important information from online brokerage research tools, like those offered by TD Ameritrade or E-trade (many other firms offer similar tools). A similar percentage get information from print magazines specializing in financial topics, like Forbes. Again, investors are still reading material in forms that require page-turning rather than swiping. Less than 10 percent of investors say they get valuable information from newsletters (think Motley Fool or Agora), investment platforms like those offered by Bloomberg Terminal), or online blogs. Also way down on the list are podcasts on financial topics, of which there are many. There is obviously going to be differences in media consumption based on age. Older investors are much more likely to be turning pages in newspapers and magazines than are younger investors. What is revealing is that 45 percent of investors who self-describe as “not very knowledgeable” or “not at all knowledgeable” pay no attention to financial media in any form, which perhaps explains why they lack knowledge. Investors who do absorb information from news media must discern between factual reporting and opinion-based statements or projections of investment performance. But the most popular choices among investors lean toward the factual dissemination of economic and corporate performance factors. There may be media voices some advisors try to avoid because they don’t like the way the information is presented or the angle the reports take, but advisors need to be aware of the voices investors are listening to in order to understand where investors get their point of view on some investment topics. Unlike investors, who can pick and choose their media choices, advisors need to be aware of all of the available options because every investor is different and every investor likely has a different roster of knowledgeable voices they listen to.